Women, are you at a loss for how to pray when your husband is struggling spiritually, or in any other way? I receive emails and messages all the time from women asking for prayer for their marriages. More often than not, they tell me that their husbands are struggling spiritually, struggling in marriage, struggling at work. It breaks my heart to see both my sisters AND my brothers struggling. The struggle is not necessary. Jesus paid the price for us all–brothers and sisters alike–to walk in victory, blessing, power, love, and a sound mind. Growing into that can be a process sometimes. But, sisters, I want to reassure you today: you can help! How can you help your husband? Well, the way to help him is NOT to try and become his Holy Spirit, Junior–trying to teach him and convict him about things. That’s God’s job, and you’re in the way (and preventing Holy Spirit from working) if you’re trying to take that job over. I have some other tips here, in Women, Yes, You Can Change Your Husband; but those are all secondary to prayer. YOUR prayers, first and foremost, will help your husband more than anything else on the planet. And by the way, this list is in no particular order. 🙂 Ready, set, go! 1. That he would be a doer of the Word, and not a hearer only (James 1:22). 2. That he would have a spirit of humility (James 4:10; Philippians 2:3). 3. That he would return to his first love for God and his first works, seeking God first with all his heart (Revelation 2:1-5; Matthew 6:33). 4. That he would have a true spirit of repentance that brings change (Acts 3:19). 5. That God would give him a heart to worship Him (John 4:23-24). 6. That he would find where he fits in within the Body of Christ (Ephesians 4:14-16). 7. That he would walk in complete healing and deliverance in every area (2 Timothy 1:7; Isaiah 53:4-5). 8. That he would be free from anger and filled with love (James 1:19-20; 1 John 4:18). 9. That he would have a great love of the Word (Psalm 119:9-16). 10. That he would hunger and thirst after righteousness (Matthew 5:6). 11. That he would be filled with godly wisdom and would make godly choices (Isaiah 30:21; James 1:5-7). 12. That he would be totally restored in every area of life (Joel 2:25-27). 13. That he would be inspired to choose God daily (Deuteronomy 30:19-20; Matthew 6:33). 14. That God would open the Word up to him and give him revelation and understanding of it, making it come alive in his heart (John 16:13-15). 15. That he would hunger for the Word (Psalm 119:35-36; Psalm 119:103). 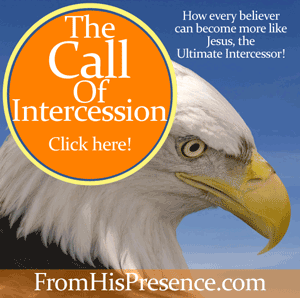 Check out my 3-part MP3 teaching series about how to become an intercessor if you haven’t already! Click the image to visit my Gumroad store. 16. That he would hide God’s Word in his heart, that he would not sin (Psalm 119:11). 17. That he would have godly character (Romans 8:29). 18. That he would be continually filled with the Holy Spirit (Ephesians 5:18). 19. That he would be filled with the fruit of the Spirit (Galatians 5:16-25). 20. That Christ would be formed in him (Galatians 4:19). 21. That he would return to God with all his heart, with fasting, weeping, and mourning; that he would be a man of fasting and prayer with a right heart (Joel 2:12). 22. That he would have favor in his job (Deuteronomy 28:8). 23. That he would love and serve people like Jesus does; that he would have God’s own heart for people (Philippians 2:1-4; Mark 12:31; Ephesians 5:1-2). 24. That he would walk in purity (Ephesians 5:3-11). 25. That God would open his heart to receive covenant friendships–and that God would send the right men with whom your husband can become covenant friends (1 Samuel 18:3). 26. That God would break every addiction off him (including addiction to his phone, to TV, to work, etc) (1 Corinthians 6:12; John 8:36). 27. That God would give him new songs and hymns of praise (Ephesians 5:19). 28. That he would have a grateful and thankful heart (Romans 1:21). 29. That God would make him complete in every good work and be glorified in your husband daily (Hebrews 13:20-21). 30. That his heart would be good soil for God’s Word; that he would hear the Word, understand it; and bring forth good fruit–30, 60, and 100 times more than was sown (Matthew 13:1-23). These prayers are God’s will for your husband, no matter what he is going through. And as you pray God’s own Word back to Him, His Word will not return void! Papa will answer your prayers! Have you prayed these prayers and seen God move? If so, please leave your testimony below. Your testimony will encourage other women whose husbands are struggling too! Thank you in advance. Churches as a whole don’t seem willing to – another reason maybe that churches are majority married and as % of membership, you find very few unmarried. Very few. Amazing word! Sometimes we think we’re the only ones going through life’s marital struggles. This is an issue that is serious. But yes Jamie, we must pray for our husbands. I admit I grow weary in the waiting ?, but God who is faithful, will complete it!☺ Thanks for these verses . I will pray them over my husband. God bless you! What a blessing this message is and will continue to be. I have been seeking the Lord for exactly this kind of direction in praying for my husband!!! Thank you so much for your faithfulness. This was very good, I needed to be reminded of these wonderful words of our Father. Thank You! I love the prayer and scriptures you have laid out before us. Not only will I be praying these scripture over my husband I will also be praying for other married couples as well. Thank you Jamie for this wonderful post . It’s exactly what I need to pray for my husband and our marriage . You made it so easy for us all who feel led by Father God to pray for our husbands who are in need of our prayers and covering!! You are a blessing to all of us . No words can say just how much!! Love ya, God bless you again and again Jamie.!! I am most encouraged by the responses. Thank you all. Why can’t churches be this equally encouraging? Read article last night that unmarrieds leaving the church as it is viewed as “for married only” … a social club. If Jesus had walked into a church today, as an unmarried man, would He get pushed aside? YEP !!! My family is in crises all around in my marriage, children, finances, body, and mind. I am using these scriptures to declare over us until I see breakthrough. Thank you Jamie. Thanks Jamie. I am praying these into my children’s marital futures already! Thank you for posting these scriptures. I need prayer for my marriage of 37 years. Addiction and depression are tearing us apart . We need direction on a move and we need a home church and Godly friends. I will pray these over us both and over our daughters and grandchildren. I am blessed I came across your site. My marriage is so messed up and I’m almost ready to leave my husband. It all started in 2016 after my knee replacement he started texting another women, drinking everynight and binge drinking on weekends till 6 am the next morning. He abandon me when I needed him. He is very angry and calls me names when he’s drinking. In September of 2017 I went and got myself baptized again with hopes to bring back my faith in God. Still today he leaves me, goes out drinking, lies to me, and never answers his phone when out and cut me off from any financial support. I have prayed, I have gotten angry at God, I have lost friends, my husband blames me for all his own mistakes. I am tired weak and losing any hope in saving my husband from his alcohol abuse. I know he loves me at least I think so even though he rarely says it, and needs God to save him. He won’t speak to me much anymore says I’m messed up lightly speaking, has put our son in the middle, I don’t know why God hasn’t intervened does he want me to leave my marriage? Or stay living with this evil selfish man? Hi, the hardest part is waiting on God, it seems like sometimes He doesn’t move when we want. He is an on time God and moves when He sees fit to. Don’t give up sister I prey for you and you husband and son, please pray for us as well!